A key focus of conservation over the last decade has been on the valuation of services provided by ecosystems. Most attention has centered on provisioning (e.g. food, fiber) and regulating (e.g. pollination, carbon sequestration) services, leaving the cultural services provided by nature largely unaddressed. Yet many species have considerable cultural value, as icons and mascots, and as part of traditional fables, songs and rites of passage; the species that may hold some of the highest cultural values may be the species that are at greatest risk of extinction. In addition, the likelihood of conservation action may be closely linked to the cultural services provided by a species. Cultural services are a critical component of the ecosystem services concept, but has rarely been addressed because the values are often intangible and difficult to measure quantitatively. We are interested in questions such as: Can we quantify the cultural value of a species? How are human communities affected by species extinction? What is the role of education about the natural world in mediating this impact? 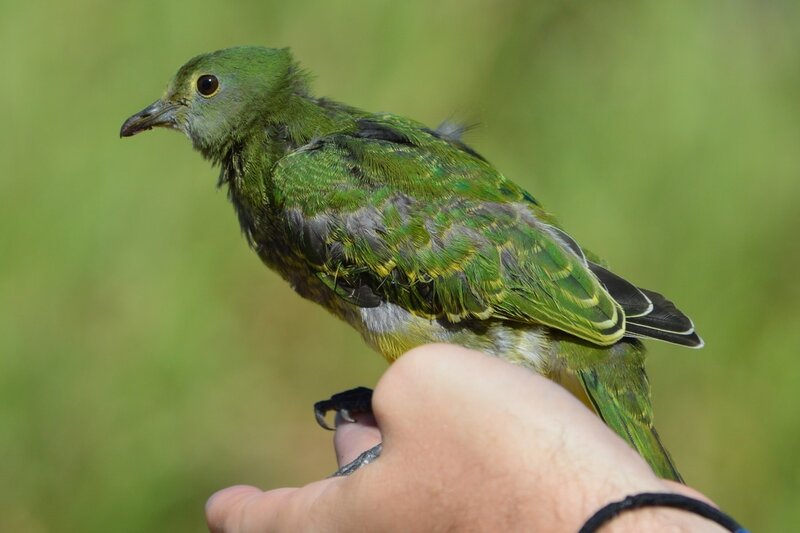 Juvenile Mariana Fruit Dove. Photo by James Lucas.